The Miami Heat put the 2011 defeat behind them,beating Oklahoma City Thunder to become champions in 2012. The team included the “big three” – Lebron James,Dwyane Wade and Chris Bosh. 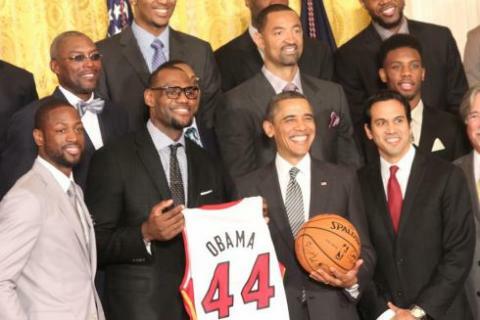 Obama said it wasn’t just the big three responsible for the Heat’s success,citing team effort. “So that team mentality with everybody doing their part is what finally put the Heat over the top,” he said. Click on photo to enlarge or download: Lebron James presents an autographed basketball to President Barack Obama.Obama praised members of the team for maintaining fatherly roles. Erik Spoelstra,head coach of the Miami Heat,said the team is happy,humbled and honored to be at the White House. “We actually hope that this team serves as an inspiration to the nation of what a group can do when you come together and sacrifice your egos for a greater goal,” he said. James presented a basketball autographed by members of the team to the president,while Wade gave him a No. 44 Miami Heat jersey.